Local councils are among Yemen’s most important state institutions. Responsible for providing basic public services to millions of Yemenis, local councils represent official governance and the Yemeni state for much of the population. The intensification of the conflict between the internationally recognized government, its regional backers and the Houthi group since March 2015, however, has heavily impacted funding and security for local councils, undermining their ability to provide services effectively in most areas of the country. In many areas, this absence of effective official governance has created fertile ground for non-state actors to exert their influence. In the areas under Houthi control, Houthi supporters closely monitor local council activity. In the southern coastal city of Aden, local councils are caught among competing armed militias that form part of a broader power struggle between southern secessionists and the internationally recognized Yemeni government. Despite the challenges they face, local councils remain important instruments for coordinating humanitarian relief efforts and local-level conflict mediation. In the absence of central state authority, a number of effective local, self-governance models have emerged, notably in Marib and Hadramawt governorates. At some stage a new system of governance will need to be drawn up to reflect the new realities on the ground; these models may indicate a way forward. Local councils are among the best-equipped and best-established institutions to support a shift away from the previous centralized model. The currently reduced capacity of local councils is cause for much concern as the conflict rages on and Yemen’s economic and humanitarian crises deepen. Irrespective of how the conflict progresses, it is imperative that local, regional and international actors seek not merely to keep local governance structures from collapse but to enhance the capacities of local councils in post-conflict scenarios. Local councils are among Yemen’s most important state institutions. Responsible for providing basic public services to millions of Yemenis, local councils represent official governance and the Yemeni state for much of the population. The intensification of the ongoing conflict between the internationally recognized government and the Houthis since March 2015, however, has heavily impacted funding and security for local councils, undermining their ability to provide services effectively in most areas of the country. The reduced capacity of local councils to function is cause for much concern as the conflict rages on and Yemen’s economic and humanitarian crises deepen. With an aim to inform stakeholders on options for supporting local councils in the near and long term, this policy brief, which is based on a more extensive White Paper , provides insight into the current challenges that local councils face. The first section provides a view of how local governance throughout Yemen is evolving amid conflict and instability. As the conflict creates a political and security vacuum, non-state actors have stepped in to provide services at the local level. Despite the conflict’s negative impact on their ability to operate, however, local councils have acted to coordinate humanitarian aid and to mediate conflict at the local level. In the north, Marib governorate has pushed for greater local autonomy, and, like Hadramawt in the south, has achieved a degree of success in effective self-governance. 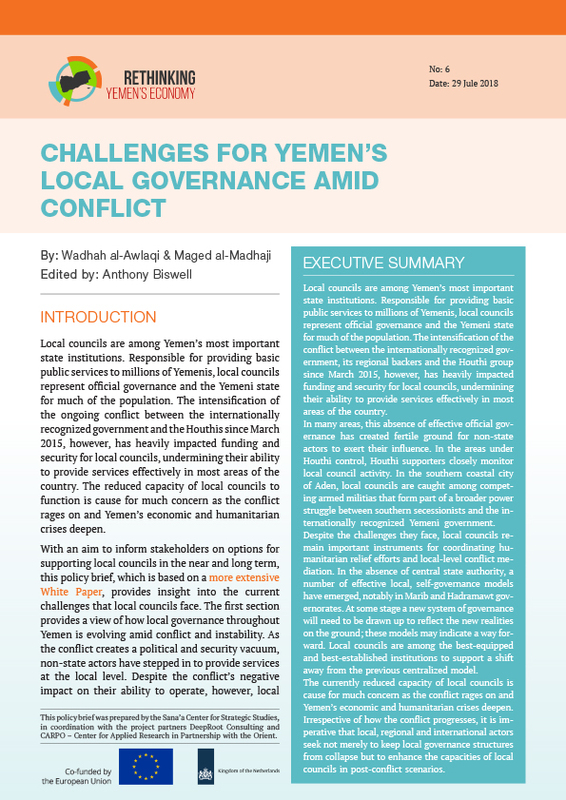 Regardless of how the conflict progresses, stakeholders in Yemeni governance must seek not merely to prevent local governance structures from collapse, but also plan in advance to enhance the capabilities of local councils in post-conflict scenarios. As such, the third section of this brief provides recommendations for local, regional and international actors to support local councils in the short term while building towards a longer-term post-conflict stability. In many areas of Yemen, as the political and security vacuum has widened, local power brokers, including local authorities, have begun to operate with a greater degree of autonomy. Local actors have become increasingly disconnected from developments occurring elsewhere in the country and are more inclined to pursue their own agendas, at times with the support of their respective regional backers. This has led to a rise in non-state actors exerting their influence in local affairs, including the Houthis and a growing variety of actors in southern Yemen. As the conflict has unfolded and the state’s already limited ability to provide services and security for its citizens has continued to erode, in many areas civilians’ trust in local councils has fallen. In the absence of effective formal governance non-state actors — often armed groups — with greater resources at their disposal have increasingly exerted influence in local affairs. In Yemen’s north, with the exception of Marib and al-Jawf, the Houthis have exerted influence at the local level through so-called “Popular Committees”. Although the Houthis have not made any substantial changes to the local governance framework, they have at times redirected funds earmarked for local development projects. They monitor local councils located in areas under their control to ensure local councils distribute revenue and channel external humanitarian aid consistent with the agenda set by the Houthi leadership. In 2015, al-Qaeda in the Arabian Peninsula (AQAP) took control of Mukalla in Hadramawt governorate. AQAP integrated itself among local communities by providing social welfare programmes and supplying Mukalla with food and water despite shortages in other areas. Although AQAP’s presence was not unopposed, the group continued to govern until its withdrawal from Mukalla in April 2016. After AQAP’s withdrawal, local authorities in the city struggled to provide services and now depend on external support from international organizations and the Saudi-led coalition. In other cases, militias fighting on the same side of the conflict nonetheless act in competition when it comes to local governance. In Taiz governorate, where Houthi-Saleh forces began laying siege to Taiz city in March 2015, the Saudi-led coalition, and particularly the UAE, has assisted the rise of Salafi militias. The UAE’s reluctance to engage with Islah — due to the party’s links with the regional Muslim Brotherhood — meant that it turned to other anti-Houthi groups, such as the militias headed by Salafi military commander Adel Abdu Farea, more commonly known as Abu al-Abbas. The UAE’s support of Abu al-Abbas fuelled animosity between his men and Islah-affiliated militias, which on several occasions has led to the outbreak of clashes between these supposedly pro-government factions as they compete for influence on the ground. The 2015 Houthi-Saleh takeover of several southern districts was debilitating for local institutions providing public services. After retaking these areas, the Saudi-led coalition — and the UAE in particular — assisted in restoring some services. However, the coalition’s backing of multiple, sometimes competing authorities in different sectors, especially security, generated tension and made effective local governance difficult. As in Taiz, local councils in Aden have been forced to withstand the pressure of regular infighting among competing armed groups. In the southern port city of Aden and across south Yemen more broadly, the conflict has intensified calls for the establishment of a new, independent southern state. The UAE has supported various political and security actors who advocate for southern independence. In April 2017, Yemeni President Abdo Rabbu Mansour Hadi, objecting to the UAE’s ties to southern secessionists, fired a number of southern leaders from his government. The following week these leaders formed the Southern Transitional Council (STC) and rapidly began establishing a parallel structure for local governance across southern Yemen. As the local clout of southern secession leaders has increased, the standing of the Hadi government has decreased. Critics of the Hadi government claim that public service delivery in Aden is being held up by the government’s economic mismanagement and outright corruption. The continued competition between secessionist forces and Hadi loyalists is destabilizing for local councils in southern Yemen. Animosity in Aden between local UAE-backed forces and other armed factions loyal to Hadi has repeatedly boiled over, with the most recent of many clashes occurring at the end of January 2018. Clashes between the two groups prevent local councils from operating in a secure environment. Aside from the threat of violence, local councils are vulnerable to interference by armed militias eager to assert themselves at the local level. Local councils face excessive changes in leadership, which hampers the ability to carry out long-term work. Local councils lack clear planning over both the short and long term, and instead are forced to repeatedly address urgent issues. Local councils lack a clear and well-supported budget, causing their work to be temporary, variable, and dependent upon the support of external actors such as the Emirati Red Crescent. The internationally recognized government has reduced their functions, leaving them without effective power on the ground. Service authorities and utilities are ineffective, reducing the ability of local councils to provide services. NGOs bypass the local councils as an implementation mechanism, and a lack of partnerships with these organizations has caused NGOs to lose valuable context that could make their interventions more successful. Multiple sources of authority exist, including security forces which seek to impose their desires on the activities of local councils. However, despite struggling to provide services, local councils have helped to coordinate the flow of external humanitarian aid during the conflict. In a number of governorates, local council members transmit information to international non-governmental organizations (INGOs) through semi-informal communication channels, assisting with humanitarian needs assessments. They have also helped to prevent the spread of cholera by channelling external support to local health facilities. In some instances, local councils in Yemen have played a role in facilitating conflict resolution at a local scale, coordinating local ceasefires, ensuring safe passage of humanitarian aid across frontlines, or organizing prisoner exchanges between warring parties. Hadramawt, in eastern Yemen, is the country’s largest governorate and most prolific oil producer. Many in Hadramawt have long been frustrated with the lack of oil revenues reinvested into the governorate. Hadramawt’s desire for greater control over — and an increased share in — its own economic resources was one of the central demands made at the Hadramawt Inclusive Conference (HIC) held in April 2017. Since its establishment, HIC and other members of Hadramawt’s socio-political elite have made the governorate’s participation in any future federal state — or an independent southern state — contingent upon it receiving a larger share than it currently does of the revenues from it own resources. Specifically, the HIC demands that 20 percent of oil revenues extracted from Hadramawt be reinvested back into the governorate. It is highly unlikely that local Hadrami officials would be willing to adhere to the former decentralization mechanism defined by the Local Authority Law (LAL) of 2000, which is the legal framework that formally established local councils as government entities. The internationally recognized government appears to be taking seriously Hadrami demands for a greater share of resource revenues: it now pays the Hadramawt Tribal Confederation (HTC) and Petro Masila, the local oil company that runs the Masila (Block 14) oil field, for access to the field. It also sends payments of cash or fuel to local authorities and the UAE-backed Hadramawt Elite Forces in the coastal city of Mukalla for access to the oil export facilities located there. These payments help to lessen the burden on local councils. There is also a substantial network of wealthy Hadrami businessmen living in neighbouring Gulf countries; during the conflict, these businessmen have played a significant role in financially assisting local councils to provide services and implement local development projects. These various revenue streams have thus allowed the authorities in Hadramawt to continue to operate – and with a degree of local autonomy – insofar as they are able to regularly pay civil servant salaries, invest in local services, and finance the development and maintenance of electricity, water and sewage infrastructure. Prior to the current conflict, and despite the presence of vital energy resources, Marib lacked infrastructural development due to the central government’s monopolization of oil and gas revenues. The current conflict has, however, led to a change in fortune for Marib. The protection offered by Saudi-led coalition forces, coupled with Marib’s own robust and united security apparatus, has allowed the governorate to enjoy a comparatively high level of security. From this position of relative security, in mid-2017 Marib negotiated a deal with the internationally recognized Yemeni government for the governorate to keep up to 20 percent of revenues from oil extracted in the governorate, over which the central government had previously had a total claim. The agreement reflects a broader effort by Marib’s local governing authorities to take ownership of its oil, gas, and electricity facilities. Since the agreement, local councils have helped to keep energy facilities functional and to increase capacity through consultations with local stakeholders. They supervise the timely distribution of oil, diesel, and gas derivatives to Marib homes. Unlike many local councils in Yemen, they provide public services and coordinate local development projects. Since taking control of a larger share of natural resource revenues, Marib’s relative economic boom has led tens of thousands of internally displaced persons (IDPs) to seek refuge in Marib. Despite this influx, Marib is benefiting from a period of relative stability and sustained economic development. In Marib, civil servants are paid and public services are generally provided. Decision making in the local governance model generally includes consultations with various societal groups, even while the authorities remain intolerant of direct political dissent. The governorate has thus come to represent a unique and reasonably effective decentralized model of local governance in Yemen bolstered by the unity of the population, tight-knit security, and economic resources. The inability of the central government during the conflict to respond to local needs prompted Hadramawt and Marib, two relatively resource-rich governorates, to exceed the legal mandate bestowed upon them by the 2000 Local Authority Law. In both governorates, there is an emerging model of local governance that other governorates could follow, whereby the local community has been more included in decision-making and managing local affairs than it was prior to the conflict, with this being facilitated by both the development of local resources and support from the central government. Since their inception, local councils have been a critical governing institution in Yemen. However, the ongoing conflict has severely impacted their ability to provide essential services to their communities at a time when humanitarian and economic crises are worsening. In some areas, non-state actors compete to provide services, thereby undermining the trust of Yemeni citizens in local councils. In other areas, local authorities have evolved fairly successful forms of self-governance in the absence of an effective centralized government. This policy brief has sought to illuminate the challenges faced by local councils during the ongoing conflict. Local, regional and international actors concerned to establish stable and effective governance in Yemen must actively support local councils to meet these challenges. Some current examples, such as Hadramawt and Marib, may guide the future shape of local governance in Yemen. Local councils should play an important role in any future post-conflict reconstruction process, but bolstering local councils should not wait until the end of the conflict. Given how critical a role local councils have played in governance for nearly two decades, they promise to be valuable partners in rebuilding trust and stability. Regional and international stakeholders should coordinate efforts to restore the CBY to a fully functioning unified national entity. From the onset of political unrest in 2011 until just before the relocation of CBY headquarters in September 2016, the central bank played a vital role in maintaining local councils’ ability to deliver basic services by continuing to disburse civil servant salaries and helping to cover operational costs. It is currently difficult for local councils in any of Yemen’s 22 governorates — with the exception of Marib, and to a lesser extent Hadramawt — to secure sufficient operational revenues. The international community should take constructive measures to develop a mechanism between the warring parties for the nationwide collection of state revenues such as taxes and customs. The re-establishment of public services in all areas would provide the incentive for the parties to collaborate in this effort. A state budget that reflects the current situation in Yemen will ensure that greater financial support is provided to local councils. The Social Fund for Development (SFD), a quasi-governmental poverty reduction body, can channel allocated revenues to local authorities and can jointly implement public service projects. International donors and INGOs should enlist local councils as liaison points with local organizations and private sector actors. This approach will increase the councils’ legitimacy and encourage the local community to unite under formal government structures. It may also create a more decentralized service delivery model, which in turn may extend the reach of reconstruction efforts. Any support filtered through the local councils must include an oversight mechanism to avoid misappropriation of funds. granting local authorities the power to work with international donors in meeting humanitarian and development needs at the local level. International stakeholders should target the implementation of local capacity-building programs that improve the performance of the local judiciary and security services. This may also entail financial support to rebuild and improve their capital infrastructure. This will allow judiciary and security services to operate effectively and maintain legitimacy. While acknowledging local complexities, international stakeholders should discourage parties to the conflict and regional players from intervening in the activities of the local judiciary or creating competing entities that undermine state legitimacy. INGOs and other actors should support community-driven initiatives constructed in such a way that they reinforce the effectiveness of, rather than circumvent, official local government institutions. Promoting bottom-up, inclusive local governance will help to avoid claims of bias or discrimination while curbing the appeal of non-state actors as alternatives to the state. A comprehensive and realistic assessment of which individuals and groups are in control at the governorate and district levels, as well as an assessment of these entities’ capacities to provide services, will help domestic policy-makers (with the support of the international community) to develop post-conflict strategies to restore state functions, such as the provision of security and public services. Peter Salisbury, “Yemen: National Chaos, Local Order,” Chatham House, last modified December 20, 2017, accessed May 23, 2018. https://www.chathamhouse.org/publication/yemen-national-chaos-local-order. Thomas Joscelyn, “Arab Coalition Enters AQAP Stronghold in Port City of Mukalla, Yemen,” Long War Journal, last modified April 25, 2016, accessed May 23, 2018. https://www.longwarjournal.org/archives/2016/04/arab-coalition-enters-aqap-stronghold-in-port-city-of-mukalla-yemen.php; Elisabeth Kendall, “How Can al-Qaeda in the Arabian Peninsula Be Defeated?” Washington Post, last modified May 3, 2016, accessed May 23, 2018. https://www.washingtonpost.com/news/monkey-cage/wp/2016/05/03/how-can-al-qaeda-in-the-arabian-peninsula-be-defeated. “UAE, Saudi Send Weapons to Taiz Resistance,” Emirates 24/7 News, last modified January 7, 2016, accessed May 23, 2018. http://www.emirates247.com/news/region/uae-saudi-send-weapons-to-taiz-resistance-2015-11-07-1.609560. “عاجل: استشهاد حمزة المخلافي شقيق قائد المقاومة الشعبية بتعز (صورة [Breaking News: Martyrdom of Hamza al-Mikhlafi, Brother of the Popular Resistance Commander in Taiz], Al Mawqea, last modified April 23, 2016, accessed May 23, 2018. http://almawqea.net/news.php?id=7226#.V9k0FJN96lO; “عاجل.. الشيخ حمود المخلافي يكشف عن تفاصيل مقتل شقيقه بتعز” [Urgent: Sheikh Hamoud al-Mikhlafi Reveals the Details of His Brother’s Death in Taiz],” Ababiil, last modified April 23, 2016, accessed May 23, 2018. http://ababiil.net/yemen-news/82187.html; “قائد كتائب حسم يكشف عن ملابسات استشهاد حمزة المخلافي وتفاصيل المكالمة التي اجراها مع الشيخ حمود سعيد عقب الحادثة. [Commander of Haskat Brigades Reveals the Circumstances of the Martyrdom of Hamza al-Mikhlafi and the Details of the Call He Made with Sheikh Hamoud Said After the Incident],” Yemen 24, last modified April 24, 2016, accessed May 23, 2018. http://yemen-24.com/news27572.html. Researcher interview, Aden senior local council leader, May 2018. In Aden, and elsewhere across south Yemen, the UAE has assembled, trained, and continued to back a number of local security forces that operate with varying degrees of independence from the internationally recognized government. These forces include the Security Belt forces in Aden, Lahj, and Abyan governorates; the Hadramawt Elite Forces; the Shabwa Elite Forces; and the more recently formed al-Mahra Elite Forces. “Al-Zubaidi and the STC Members are in Al-Mukalla City,” Southern Transitional Council, 2017, accessed May 23, 2018. http://en.stcaden.com/news/7959. “Al-Zubaidi Issues a Resolution to Appoint Local Leaderships in Shabwah Governorate,” Southern Transitional Council, 2017, accessed May 23, 2018. http://en.stcaden.com/news/8084. Sana’a Center for Strategic Studies, “Yemen at the UN—January 2018 Review,” last modified February 11, 2018, accessed May 23, 2018. http://sanaacenter.org/publications/yemen-at-the-un/5389#Clashes_in_Aden. Researcher interview, Aden local council officials, May 2018. Baron et al., “Essential Role of Local Governance;” Oil production has declined annually since 2001. This has placed Yemen’s economy under increased pressure, despite the 2009 opening of Yemen’s liquified natural gas (LNG) terminal in the Balhaf, Shabwa governorate. In 2014, approximately 70 percent of the national budget came from Yemen’s oil and gas resources. Following the escalation of the conflict in March 2015, oil and gas production in Marib, Shabwa and Hadramawt governorates stopped, subsequently depriving Yemen of its major source of revenue. In 2015, there was a 54 percent year-on-year decrease in state revenues for the annual budget. Researcher interview with confidential source with close ties to CBY in Aden, June 2018. Zakat is an “Islamic tax” or financial obligation imposed on all Muslims who meet the necessary wealth criteria. Researcher interviews conducted with local council directors and members in Houthi-controlled areas, September 2017. Researcher interview, Ibb, October 2017; researcher interview, Marib, September 2017. In February 2014 oil from Hadramawt accounted for an estimated 53 percent of total oil production in Yemen. See World Bank, Republic of Yemen: Unlocking Potential for Economic Growth (Washington, DC: World Bank, 2015) accessed May 23, 2018. https://openknowledge.worldbank.org/handle/10986/23660. A total of 160 participants attended the conference, which led to the appointment of 52 members that make up the HIC executive decision-making authority. Researcher interview with Dr. Abulkader Ba Yazid, Secretary General of Hadramawt Inclusive Conference, Jordan, September 2017. Researcher interview with Dr. Abulkader Ba Yazid, Jordan, September 2017. The central government in Sana’a issued the Local Councils Law in 2000 as a way to try and address calls for greater regional autonomy, particularly among the Houthis in the north and the Southern Movement. The law stipulated that, while the central government would maintain control of foreign policy and national security – and would retain the ability to veto local action – local councils now had responsibility for running day-to-day affairs. The law effectively made local councils one of the most important public institutions in Yemen. Local councils were to be directly elected and were to have greater decision-making authority over financial resources and the implementation of development programs. Although oil and gas revenues remained in the hands of the ruling authorities in Sana’a, local councils were permitted to collect commercial taxes and to tax residents for the use of state-operated utilities such as water and electricity. Researcher interview with Yemen expert Peter Salisbury, March 5, 2018. Large portions of this sections are based on the following: researcher interviews with local council directors in Marib, November 2017; “Yemen’s Urban–Rural Divide and the Ultra-Localisation of the Civil War,” workshop organized by the London School of Economics Middle East Centre, March 29, 2017, London, UK. According to Yemen’s national statistics, less than 1 per cent of total government expenditures were allocated to Marib in 2015. Ben Hubbard, “As Yemen Crumbles, One Town Is an Island of Relative Calm,” New York Times, last modified November 9, 2017, accessed May 23, 2018. https://www.nytimes.com/2017/11/09/world/middleeast/yemen-marib-war-ice-cream.html; Adam Baron, “Not Only a Pawn in Their Game,” European Council on Foreign Relations, last modified November 16, 2017, accessed May 23, 2018. http://www.ecfr.eu/article/commentary_not_only_a_pawn_in_their_game. Despite the agreement between Marib and the internationally recognized government, as of this writing ongoing disputes between the CBY’s Marib and Aden branches has led to the Marib CBY refusing to deposit any rents from the governorate’s gas, oil and gasoline production in accounts at the Aden CBY. Marib-based journalist Ali Aweidhah, speaking to the researchers in June 2018, estimated that Marib’s population grew from some 240,000 people at the beginning of the conflict to some 2.4 million as of this writing. Researcher conversation with a source with close ties to the CBY in Aden, June 2018. Wadhah Al-Awlaqi is an economic researcher at the Sana’a Center for Strategic Studies. He is also the assistant director of Banking Accounts General Department at the Central Bank of Yemen (CBY). Since 2006, he has helped to develop monetary and macroeconomic policies at the CBY, and was previously the Central Bank’s deputy manager of the State Budget Department. Al-Awlaqi also has more than a decade of experience in various management and private sector consultancy capacities in Yemen; was the director of administrative sciences and an assistant professor at the German Medical College of Science and Technology; and participated in setting up the college’s future business plan and vision. Al-Awlaqi holds a master of business administration in finance from the Korean Institute for Science and Technology (KAIST), Seoul, South Korea, and a bachelor of science in accounting from Ibb University, Yemen. Maged Al-Madhaji is executive director and a co-founder of the Sana’a Center for Strategic Studies. Al-Madhaji’s research and commentary on Yemen have been published through various academic platforms, including the London School of Economics and the Arab Reform Initiative, and he is a regular commentator on Yemeni affairs for Arabic media. In 2012 he was appointed to the Preparatory Committee for Yemen’s Conference of National Dialogue, before resigning later the same year in protest of the committee’s exclusionary policies. Anthony Biswell is an assistant editor and researcher at the Sana’a Center for Strategic Studies. Prior to joining the Center, Anthony was the Senior Yemen Analyst for The Delma Institute in Abu Dhabi, managing research projects and advisory programs, as well as training and mentoring junior analysts. He is also operating as a private, external Yemen consultant. Previously, Anthony was an editor and researcher for IHS in Yemen, where he was based in 2010 and 2013-2014. He holds an MA in international conflict studies from King’s College London and a BSc in politics from Cardiff University.